Sulphates are detergents used in shampoos to get rid of dirt and grease. But, they can be harsh and strip away the natural protective oils from your scalp and hair, resulting in dry flaky scalp, and lusterless hair. And beware of term ‘plant derived’. Claims such as ‘sodium lauryl sulphate (SLS) derived from coconut’ are nothing but a cute way to detracts the buyers from really knowing what they are using. All SLS is derived from vegetable oil, usually coconut, but it undergoes lots of processing involving one of the harshest chemicals – sulfuric acid – and is therefore classed as synthetic ingredient. So, there is nothing coconut-y about it. It’s pretty simple. Make your own shampoo! When the word ‘shampoo’ comes to your mind you think of soap and lather. In fact the word shampoo comes from Hindi (Indian) word ‘champoo’, which itself is derived from the Sanskrit root capayati, which means to press, knead or rub. In India the term champoo was used for head massage, usually with some form of herb infused oil. And only after thorough oiling and massaging the hair would be washed. Ancient hair cleansers were made by mixing powdered herbs, medicated flowers, and water. Sometimes floral and herbal infusions were used. Today the most important ritual of champoo or champi is nearly extinct, even from the place where it all started — India — and hair washing, using detergent based cleansers, is what people choose. Convenience for quality is the price you pay for a busy life. There are some amazing ingredients in nature that make super hair cleanser and leave our hair clean, healthy, and smelling awesome. But be prepared to wash your hair with some atypical looking potions. These potions, though, will give you gorgeous hair, so they are worth trying out. The shampoo recipe that I am going to share with you needs no pre-preparation. Most of the ingredients are not difficult to find – can be brought online or from an Indian shop. To make this shampoo you will need – chickpea flour, orange peel powder, henna powder, and some honey. Chickpea flour (Besan): Indian women have used chickpea flour and other lentil flours in hair care and beauty preparation for thousands of years. Rich in protein, chickpea flour will make your hair shiny and strong. It also cleans the hair very well. Orange peel powder: The orange and other citrus peels help to gently exfoliate the dead skin and flakes on the scalp. It also balances your scalp pH and the antiseptic and anti-inflammatory properties may help with dandruff. Plus it smells uplifting and refreshing. Henna: Henna coats the hair shaft, and adds body and luster and makes hair silky soft. Regular application will add reddish or brownish tinge (henna colour varies depending on where it was grown) to the hair. Also if you have grey hair then this shampoo is an easy answer to cover them. Note: Those of you with lighter hair or coloured hair should avoid henna, as it will alter the colour. Honey: Honey is very moisturizing and nourishing for your scalp and hair. It’s also a humectant – meaning it attracts and retains moisture – and therefore helps to condition the hair. Plus, its antiseptic effects will keep your scalp healthy and dandruff free. Put chickpea flour, orange peel powder, henna and fenugreek (if using) in a bowl. Finally add the honey and stir well. You can also add 1 tablespoon aloe vera juice instead of honey or both. Aloe vera is very moisturising and makes hair smoother and more manageable. To use: Wet the hair. Massage into scalp and hair just like your normal shampoo, but don’t expect it to lather. Make sure all areas are covered. And be gentle, as a rough or rapid application may disturb the roots of your hair. Leave on for 2 to 3 minutes, then rinse off thoroughly. Note: Even after you have rinsed well, there may be some shampoo bits remaining in your hair. But, do not worry as they will fall off as your hair dries and when you comb your hair. And Always use a wide tooth comb to untangle. If you hair feels clean and soft, then you do not need a conditioner. But if it doesn’t, then use a conditioning hair rinse. You can also use any of your favorite herbal teas such as rosemary, lavender, chamomile, mint, marshmallow root and hibiscus to condition and add shine. Feel free to experiment and see what works best for your hair. Chickpea flour substitute: You can replace chickpea flour with mung flour (green gram), flax seeds flour or rye flour. Make your own orange peel powder: Wash, dry, and peel orange. Eat the orange! Save the peel. Cut the peels into thin slices so they can dry faster. Spread all the peels on a tray and place under the sun to dry. You can also place them somewhere dry and warm. Turn daily until dry and crisp to touch. Grind into a fine powder. And your homemade orange peel powder is ready! How to prevent and make grey hair turned to black if i am a teenager?? I am going to try the sage tea for darkening my hair. My only concern is, could it cause allergy? By the way I really like your natural hair treatments. Hi Pinki, I have not heard of sage tea causing allergy. But do a patch test if you are concerned. Also, read the safety precautions at the end of the post. You can use reetha/marshmallow as often as you like. Hi Daniela, what is your hair like? And what do you use them for? I wash my hair with besan flour with some detangler ( I alternate marshmallow, oatstraw or slippery elm), sometimes I add honey and/or aloe, lemon/lime or orange peel, chamomile and/or lavender to my shampoo. 1x/week mask with fennugreek/keffir and gelatin rinse. 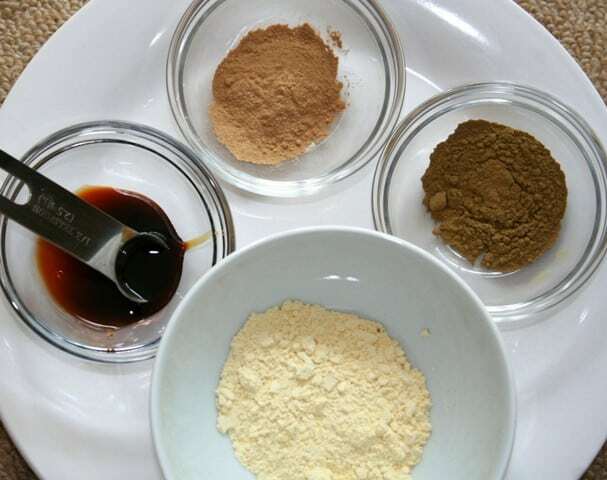 I did try other flours, but my hair was not clean, so I use only besan, that works perfectly. I also can’t use clays, amla and yucca, it gives me very itchy rash. Right now I am trying to wash my hair every other day, but the second day my hair is very oily. I did use dry shampoo on the second days, but I stoped that, because I was afraid to clog my scalp. I was also trying to use just rinse the second day, but it didn’t do anything. The hair was still oily. 1 tbsp marshmallow root, 1 tbsp chamomile, 1 soap nut. Use whole herbs and make a strong tea by boiling them for 10-15 mins in 2 cups of water. Adding soapnut will help with oiliness. You can use the same rinse in between shampoos. How much fenugreek powder do you add? Can this be used on alternate days? No, use once a week. I am using a variation of this shampoo with Besan, Multani Mitti, Neem, Tulsi, Amla, Bramhi, lemon juice and honey mix. I followed it up with methi seeds and pudina soaked water as hair rinse. My problem is by end of day 2, the ends of my hair are still silky and soft to touch but my roots have become super oily. I know I can probably use a dry shampoo but how can I fix my scalp’s PH naturally and how do I train my hair to naturally dial down the amount of oil it is producing? Pls help me! PS: Thanks for taking me back to my roots!! I LOVE your blog, thanks for everything! Hi, I am glad the shampoo mix is working for you. super informative, thank you! Quick question… How often should this shampoo be used? My hair is so dry and brittle from heat damage, and I want to make it normal again. Should I still use conditioner too? Megan, if your hair is dry and brittle either use egg yolk or this shampoo to wash your hair. How often should I use this? If I wash my hair on average about every other day is it okay to use this recipe every time? Is your hair dry or oily? For every other day this shampoo diluted works good for hair. Hi Minaz very helpfull blog! Can i use flaxseeds flour or corn flour???? Hi Rafaella, give flaxseeds flour a try. I don’t know how good it will clean your hair, you can experiment by adding shikakai powder or orange peel powder. I use flaxseeds flour with orange peel powder and it cleans my hair very well and my hair after use these shampoo its soft and manageable with shine! can this be used as a daily shampoo. Hi dear. Nice alternative to shampoo it seems. Will it remove the oil from hair? Hi Pragya, it does for me, but everyone’s hair is different. Try it out! I use sls and paraban free shampoo(khadi), does that mean it’s sulphate free? Will try this for sure! Hi Minaz, love your blog. Found it yesterday looking for a ‘besun sham-poo’ recipe. Had enormously thick long healthy hair in my teenage. People all over would admire it. A sibling would take a strand of my hair and pull, marvelling at how it stretched and stretched but didn’t break. Oiling. Was oiling daily for in the past, and that had stopped heavy hair fall in a week. boiling a handful of fresh neem leaves daily and rinsing with this (added chopped potatoes, fenugreek (methi) seeds and half a teaspoon rosemary leaves after reading benefits. Rosemary made me feel incredibly calm and centered!! Very noticeable effect). This from my ayurveda book. Henna packs once a week (with yogurt and egg added in). An amla a day, yoga, walks, healthy eating and other lifestyle changes. These will replace the shampoo. I have a very herbal range of products I buy but they have parabens. Infused that bottle with chopped onion, fenugreek seeds and rosemary leaves, to use when absolutely necessary. Hello, can you share which Ayurveda book you are using? Check resource page, I have listed it there. I did mean cassia obovata, just to add some tinge. You can omit it completely if you do not want the tinge. Would this lead to product build up on the scalp? Thanks. Thanks for sharing this with us! It looks great and I will definitely be trying it (without the henna-I don’t want my hair colour to change). However, can I make a bunch ahead of time and store it in a small bottle? I could just mix the dry ingredients and have them on hand for mixing, but I’d rather have it readily available. Thanks Ellen. Of course you can store it for later use. Let us know how it works. I just started to make my own cosmetics so I’m quite excited about this shampoo. I might have missed it, but what is the shelf life for this shampoo? Can it be stored or should it be made just for one wash? Hello Thais, You can store the powdered ingredients – besan, henna and orange peel powder – and add honey before use. Will your method be effective towards male pattern baldness? I have really oil hair and my hairline starts to recede after 25. I have tried products like REGAIN before but it doesn’t work at all. 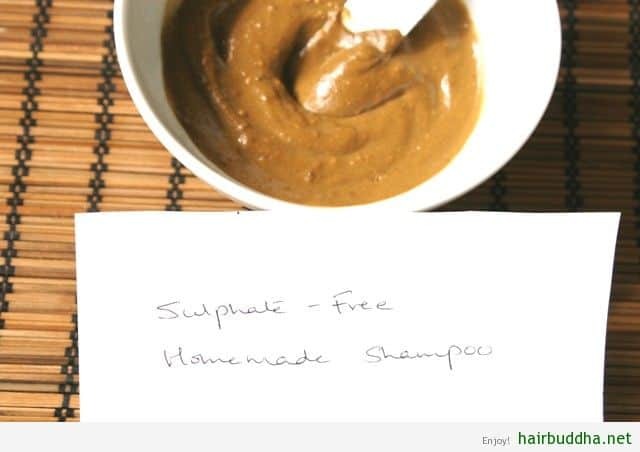 I live in Australia and if I would like to make those homemade shampoos, where could I get those Indian ingriendents? Hi Gary, Apple or carrot juice (freshly squeezed) works for some people. Apply to your head and leave for 1 hour and wash off. Try doing it thrice a week. Also, I would suggest you drink 1 tbs aloe vera juice or gel every day (get a aloe plant if you can). You will find the shampoo ingredients in most Indian shops. You can substitute besan (chick pea flour) with rye flour or rice flour. Also, you can make rice flour at home using coffee grinder. Hi Priyanka, You can obtain kali mitti (black soil) from a farm. But every state will have different soil quality, so you will have to do some research on that. Also, make sure that the farm doesn’t use synthetic pesticides or other harmful chemicals as this will do more harm than good. Instead of kali mitti you can try other some amazing cleansers such as multani mitti (fullers earth), besan, green gram flour (mung flour), and bentonite clay. my hairs are constantly falling !! !………i have tried every oil on my hair. bt no results ..
i dont know why my hairs are keep falling.. i guess its because of shampo that contains a lot of chemicals!!…. m going to try it out !! what u have mentioned above. can i add til oil with this smapoo ? plzz let me know about it as soon as possible. Smaranika, Yes you can add til (sesame) oil. But, don’t add too much as it can make your hair greasy. Start with about 1 tsp. This is a new shampoo. I am going to try it out and will let you know the outcome. The hair spray that you gave me is really nice. Hi Leenaji, Do try it and let me know how it works for you. I OIL MY HAIR AND LEAVE OVERNIGHT SO WILL IT BE EFFICIENT IN REMOVING OIL FROM MY HAIR. KINDLY GUIDE. Meg, try adding a tablespoon of reetha or shikakai powder or try adding both. Experiment a few times to see what works best for your hair.